Viewing 24 of 668 items. Set of luxurious DeVille white guest towels with a linen-texture finish. These are disposable excellent weight paper guest towels with a nice superior finish and are absorbent. Select your imprint.. Celebrate your special day with this set of air-laid paper napkins which have the look of linen with a thicker, plusher, more luxe feel. Your choice of napkin color, and imprint color. 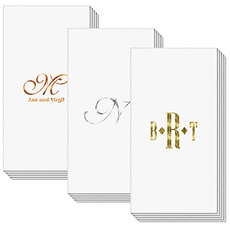 Typestyles and..
Set of premium thick air-laid paper guest towels with the plush, luxe feel of linen. Guest towels feature your initials surrounded by our wreath design. 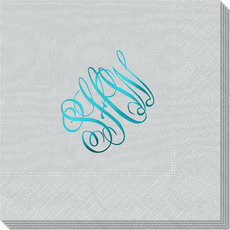 Your choice of guest towel color and imprint..
Set of luxurious Masslinn napkins which are made of 100% rayon fibers. They are extremely soft. 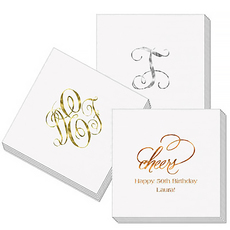 Your personalization will be imprinted in gold, silver or copper on these white napkins. You select..
Set of luxurious Masslinn guest towels which are made of 100% rayon fibers. They are extremely soft. Your personalization will be imprinted in gold, silver or copper on these towels. Approximate size..
Set of luxurious DeVille napkins with a linen-texture finish. 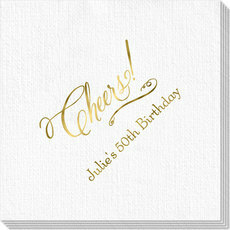 These are disposable excellent weight white paper napkins with a nice superior finish and and are absorbent. Approximate size 5 inch..
Set of luxurious DeVille white guest towels with a linen-texture finish. 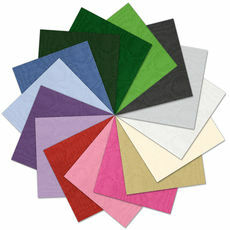 These are disposable excellent weight paper napkins with a nice superior finish and are absorbent. Select your imprint color.. 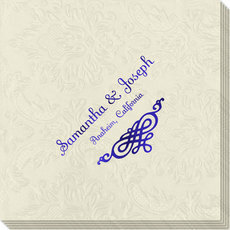 Elegant set of paper guest towels with embossed design. 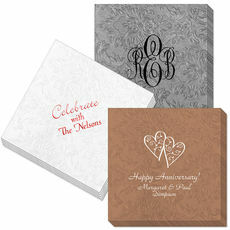 Your personalization will be imprinted in your choice of imprint and guest towel color. Your choice of typestyle and positioning. Approximate..
Set of quality moire guest towels with a rich moire finish. Select your guest towel color, imprint color and positioning of personalization. Monogram typestyle only as shown. 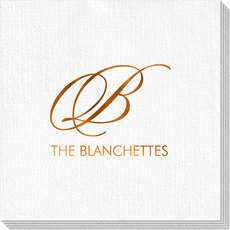 Approximate size 4.5" x..
Set of luxurious DeVille white guest towels with a linen-texture finish. These are disposable excellent weight paper guest towels with a nice superior finish and are absorbent with a larger single..